Have you seen this? An Irish advertising agency called Boys and Girls has commissioned their conference table to be made entirely of LEGO bricks. They hired the architectural firm abcg Architects to design and build the table for the agency’s conference room at their Dublin headquarters. Check out the article at The Resident Architect for more pictures and information. There’s a stop-motion video showing how it was built at the end of the article. The LEGO community has lost one of its most valuable members. Daniel Jezek created and ran BrickLink, the online marketplace for secondhand LEGO parts and sets, which is a cornerstone of the LEGO hobbyist community. He will be sorely missed. 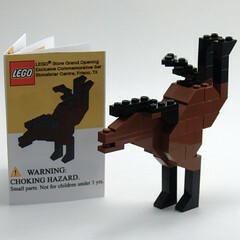 More information and a copy of his eulogy can be seen at a special page on Bricklink established in his memory. I was stunned to learn today of the passing of Nate “nnenn” Nielsen in an automobile accident. Keith of the Brothers Brick has posted an excellent eulogy which I encourage you to read along with the many comments from members of the online community included in the post. It’s relatively rare that we learn of the death of a LEGO hobbyist, but whenever it happens I always wonder what would happen to my collection of bricks after I’m gone? Estate planning is always a touchy subject, but I would encourage everyone to give it some thought, as I will be doing. And even if you’re not a space builder, consider building a Vic Viper for the Missing Man Fly-In at BrickWorld in Chicago in June or BrickCon in October. Keith is collecting contributions for a group display honoring nnenn’s work. In cooperation with the U.S. Consumer Product Safety Commission, the LEGO Group is voluntarily recalling the 8879 Power Functions IR Speed Remote Control unit, which poses a thermal burn hazard to users when batteries inside overheat. The remote control unit was sold separately as item #8879 or was included in K8882 Power Functions Kit or the K10194 Emerald Night Collection. We are writing to you because our records indicate that you purchased one of these items. LEGO Systems has found that some of the remote control units (the kind that was included in your set) are not performing correctly. If your remote is one of the affected you would have noticed that it becomes hot to the touch in the first 5 to 10 minutes of initial operation. If you did not experience this situation when you first loaded batteries into the remote then your remote is not affected. If your remote is affected, we ask that you return it to us in exchange for a new remote control unit. Simply call 1-800-718-1858 between the hours of Monday-Friday 8am-10pm ET and Saturday-Sunday 10pm-6pm ET (if outside the US/Canada dial +1-860-763-3211) and we will give you instructions on how to return the unit and also answer any questions that you might have. Thank you for your time and attention to this, and we apologize for any inconvenience this may cause. We wish your family many more happy and creative hours of building fun with LEGO brand products. Mine seems to be fine – how about yours? Portland’s KATU Channel 2 recently featured Steve Barile (organizer of BrickFest) on a TV interview. Aside from the fact that they kept using the term “Legos” they did a really good job of showing the AFOL (Adult Fan of LEGO) hobby in a respectful, positive way. It’s nice and long, too, with plenty of great shots of Steve’s LEGO collection and models. Steve seemed very relaxed and comfortable in front of the camera, which is a great feat in itself. Go Steve! You can watch the video on KATU’s Web site.